i am here to share a card i made for crafters corner blog .I had a totally different thing in my mind while starting,it dint work well and then i tried another idea and again it dint end up as i thought and finally i tried a regular embossing resist technique and realized nothing new in it.Finally i combined all 3 ideas and made this card,its one of rare moment where you start with something in mind and end up with totally something different..but who cares,crafting is always fun when experimenting and yeah the result will be totally surprising. I have cut the embossed-inked background paper into 1 inch squares,placed them on a white background paper and made a tile pattern.The heart is made with crackle technique where first you have to stamp the design and then apply embossing ink all over apply embossing powder and heat it.Repeat this 3-4 times and keep it in the freezer for 5 mins and take it out and just fold it in different different direction,it gives a beautiful crackled effect.The butterfly is heat embossed on vellum. lovely card.great idea of using the tiled pattern.Looks great. Oh Kavi this is just beautiful! Beautiful colors - the light citric shades contrasted against that black... You're really very talented! lovely card, like the tiled background, great colors and lovely butterfly !!!! Beatitful card! I love the colors and the tile pattern background! Thanks for joining us at The Perfect Sentiment! A lovely bow and very pretty card! Very, very pretty! Great layout too! 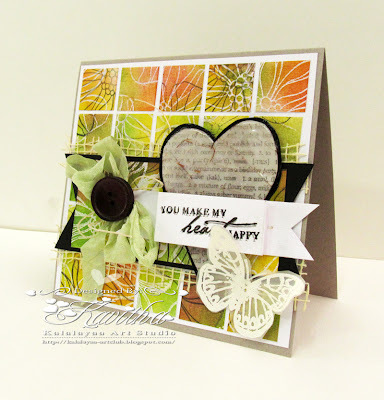 Thanks for playing along with the Whimsical Wednesday Challenge at Whimsical Designs! I love the tiling you have created for the background of this super card. 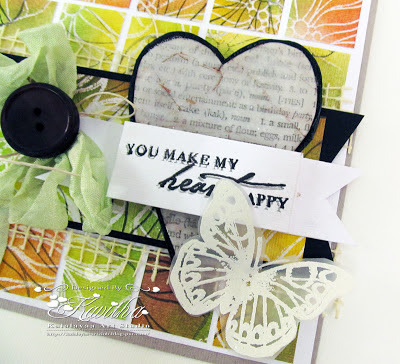 Thanks for playing along with us on the Kraftyhands Blog Challenge. Beautiful tiled background. The sentiment is lovley too. Love this grid design! The colors are so vivid and beautiful. thanks for sharing this with us girls over at Whimsical Designs..